God is perfect self gift, giving of self eternally. This is what love does – it shares in life and gives the gift of self. All gifts ultimately come from God and are to be used for the good of all. With this in mind, the seminarian is called to begin living the simple life of a disciple of Christ in preparation for ordained ministry and service for the people of God. This includes looking at the way that one gives and receives monies and gifts. All members of the Christian faithful, including the clergy, have an obligation to assist with the needs of the Church (canon 222). Fulfilling this baptismal responsibility is rooted in the grateful recognition of the many blessings God bestows on us. Discernment is called for in how one chooses to tithe one’s overall income to the Church or other charities. This includes tithing on the monetary gifts that one is given by the faithful. Acceptance of gifts in kind (i.e., use of an automobile, cell phone, electronics, airfare and other travel, etc.) is also an aspect of a minister’s call to personal responsibility and stewardship. These moral choices are a measure of the spiritual discipline and practices that will necessarily be a part of a priest’s life, and therefore of a seminarian preparing to be a priest. Any attitude of “entitlement” is the antithesis of gratitude and generosity – marks of the simple life. The minister is to serve rather than to be served. While provision is to be made for the just remuneration of those dedicated to ministry, both clergy (Vatican II, Presbyterorum Ordinis, #20) and laity (canon 231, §2), the example of Jesus and the spirit of the Gospel are contrary to an attitude of entitlement or to the expectation of financial benefit related to any ministerial service. As a Eucharistic people, we recognize that gratitude is central to the life of a Christian. This attitude is demonstrated in how we accept gifts from others and share the fruits of our labor with those in need. It is worth noting that gratitude becomes authentic only when it is communicated to the giver, whether verbally or in written form. A seminarian from St. John’s Seminary possesses a special status as a “public person,” a representative of the Church, and of the seminary community. Due to this public status, a seminarian should always be cognizant that his actions reflect upon the reputation and image of both the Church in general and of the seminary in particular. Seminarians are encouraged to take advantage of opportunities to give vocation talks in parishes and schools when invited by the seminarian’s Vocation Director or by pastors or other appropriate parish leaders. If the invitation does not come directly from the pastor, the seminarian must make sure that the pastor is informed, either directly by the seminarian himself or by the parish contact. Prior approval of the Director of Students is also needed before accepting such invitations. In its use of the goods of the world, the Church and all her members have a duty of good stewardship. Historically, Church authorities have regularly issued norms to govern the use of money and other resources in order to be accountable to our people that their goods are used responsibly. Additional, laws of civil society governing fund raising by non-profit institutions must be respected. The Code of Canon Law provides for conferences of bishops to issue norms regarding fundraising (canons 1262 and 1265, §2). The norms currently in force for the United States were approved by the Holy See on May 2, 2007, were promulgated on June 8, 2007, and took effect August 15, 2007. These norms are particular law for the Church of the United States. 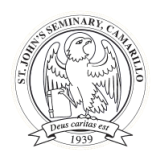 The Seminary, as a juridic person in the Church (canons 238, §1; 113, §2; 1257; §1 and 1258), is bound by these fund raising norms as are all faculty members, staff, seminarians, and others associated with St. John’s Seminary. Respecting this legislation, all of the Seminary’s own fund raising efforts receive the approval of the Archbishop of Los Angeles. Beyond the norms issued for the universal church by the Code or for the territory of a conference of bishops, each diocesan bishop also has authority to issue regulations pertaining to fund raising in his own diocese. Seminarians occasionally may be asked by the Rector, one of the Vice-Rectors or the Director of Students to assist with efforts to raise funds for the Seminary’s endowment and other projects and initiatives. Such requests are not to interfere with the seminarian’s primary formational responsibilities. Nor are such requests to interfere with the seminarian’s responsibility to his home diocese or obligations to his religious community. Seminary deacons in their Sunday parishes and interns in their assigned parishes may be asked by the pastor to preach or give talks to support diocesan annual appeals, charitable or mission appeals, parish fund raising campaigns, and similar initiatives. No additional permissions are necessary in these circumstances. Other seminarians who would be asked to give talks for these initiatives must first consult their Formation Advisors and the Director of Students before accepting the invitation. Seminarians who have taken vows in a religious community are accountable to their superiors, who may involve them in the approved fund raising activities of the particular religious institute or society. Diocesan seminarians may be asked by their bishop to assist in fund raising efforts within the boundaries of their own dioceses. In such instances, no additional permissions from anyone at the seminary are required. These activities, however, should not interfere with their responsibilities at the seminary. Seminarians are otherwise not to engage in any sort of fund raising activity without prior consultation with their Formation Advisor and approval of the Seminary Administration. Such permission will only be given for initiatives that have received all proper approvals specified in the “norms for fund raising” of the United States Conference of Catholic Bishops. Seminarians may not solicit funds for personal or family needs. In light of the above mentioned canons, if parishioners and friends freely offer gifts to seminarians on occasions such as holidays and birthdays, the seminarian is free to accept such a gift. In these instances, the presumption is that the gift is given to the seminarian rather than to the church or seminary he represents. In this case, seminarians should recall that it is vitally important to follow the appropriate etiquette of sending a written expression of gratitude (not an email but a card or letter) as soon as possible after the reception of the gift. Support for seminarians received through the generosity of parish, diocesan, national or international organizations, (i.e. Knights of Columbus, Serra Club, Young Ladies Institute, etc.) must be reported to their Formation Advisors. When receiving gifts (other than gifts from family or from people whose friendship predates the seminarian’s entrance into the seminary), with a value in excess of $100.00 should be reported by the seminarian to his Formation Advisor. For those on internship, it should be reported to the Pastor Supervisor as well as the Formation Advisor.